Joseph Lionel Graham known as Lionel, was born 25 April 1877 at Lyttelton in Canterbury. 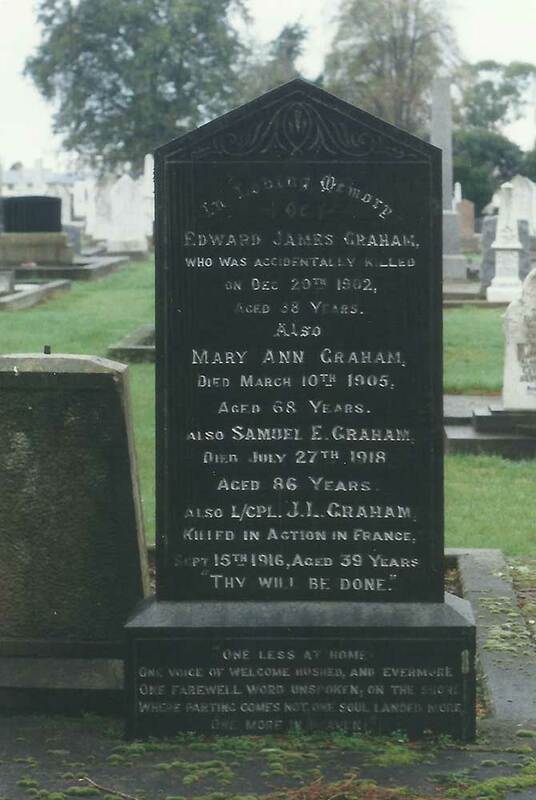 He was the seventh child of Samuel Edward and Mary Ann Graham. Lionel attended schools at Opihi and Hazelburn before leaving in 1892 for work. Lionel’s parents had moved to Timaru and his father is listed in the 1875-76 electoral roll, at section 292, William Street. By 1880-81 he had bought 160acres at Kakahu but gave his occupation as the Manager of the Government Landing service. In 1900 Lionel is listed in the electoral roll as a labourer residing at Kakahu School. 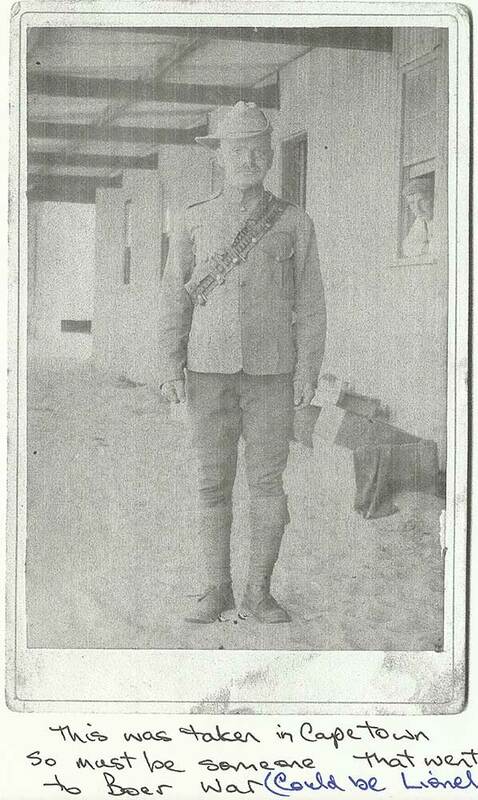 However in June 1901 he signed on to the South African Army in Capetown and served as a trooper with the Prince of Wales Light Horse, service number 34542. He listed his nationality as South African. 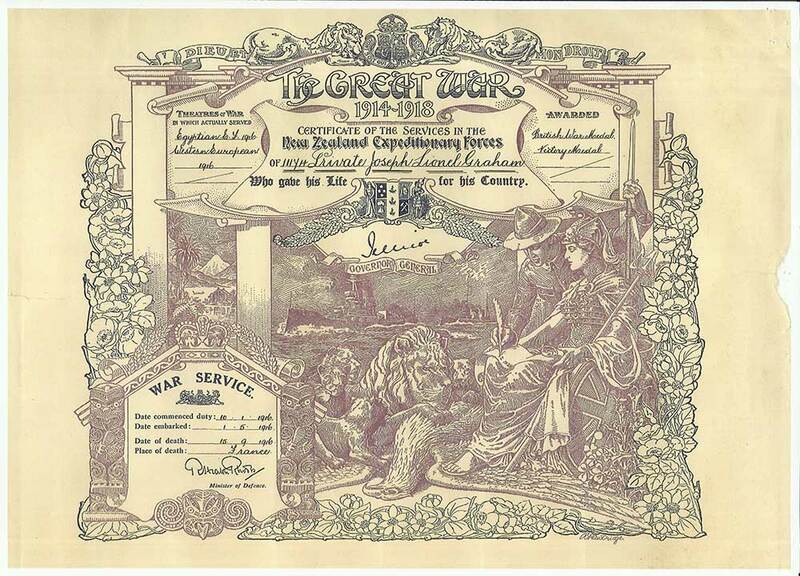 It is not known how Lionel arrived in South Africa but family hold correspondence seeking £10 as compensation to recruits for overseas passage. He was discharged at Capetown on 13 January 1902 with the rank of Lance Corporal and was awarded the Queens South Africa Medal 1901 and 1902. On the 11th October 1903 Lionel sailed for Montevideo and Buenos Aires on board the Turakina. While in Argentina he attended the wedding of his youngest brother Herbert Lewis Graham to Nellie Constance Thomson on 14 February 1907 in Buenos Aires. Elder brother Charles Graham was a witness at this wedding as he was also working in Argentina. Mr Lionel Graham, who has returned to Timaru after spending four or five years in charge of an Argentine sheep station 400 mile from Buenos Aires, naturally has some interesting things to say about that vast country. First and foremost is the fact that it is so large that one person can really see but very little of it, unless he has a mania for travelling, and keeps on the move for years. Most of his time was spent on Gibson Bros. sheep ranches, of one of which he was in charge. This had never been under the plough, but by surface sowing, and the spread of seed by stock. The native pasture had been smothered by English ryegrass and clover, and this was the condition of most of the older occupied runs. There are native shrubs too, and these are a last resort for the stock in time of drought. A great drought, one of the worst within living memory, afflicted Argentina last summer and into the winter, the worst because whereas droughts are not uncommon, they are usually regional or patchy, whereas in this case the whole country was affected. There was a great loss of stock, and pieces slumped tremendously, because many people must either sell or kill for the mere skins. These droughts make Argentina no country for a small man. The sheep most favoured are the Lincoln and the Rambouillet merino. It is found necessary to continually import fresh blood to keep up the quality of the wool, and the size of the carcase. Sheep are afflicted with many diseases. Scab is prevalent, and lung worm is a scourge among lambs and as cattle do better, this stock is most in favour. Nevertheless the stock of sheep is immense, getting on for 70 millions, as much of the interior is too dry for cattle. The station work is done very much as in New Zealand. Fences are the same, wire fences and droppers (German wire mostly). The shearing season is the same as in New Zealand, and many machines are now in use. The native shearer is not so quick as the New Zealander, but he is more careful. Mr Graham says he found these people very good to get on with. The haulage is done by horses or mules, the sheep country being too poor for oxen; and one of the novelties of the country is the vehicle, a wagon with wheels 10 feet in diameter. Within a long radius of the port, a good deal of the land is now devoted to wheat, his brother has 1200 acres this year, and an enormous total is grown. The cattle country is chiefly in the north, where there is more moisture, and a very good stamp of cattle is now common. The rich stock-breeders think little of giving thousands for a good bull, Shorthorn or Hereford, the former the most favoured. The annual agricultural show at Buenos Aires is a big thing, but it is chiefly a bull show, as many as 800 bulls have been shown at once. Reverting to sheep for a moment, Mr Graham says that Argentina will never be able to compete with New Zealand in fat lambs, the climate is against her. They cannot grow turnips, the heat of summer being too great, and an experiment with pumpkins as an alternative, made by Mr Gibson, proved a failure. As a country, Argentina may be likened to Canterbury, enormously magnified. There is the western snowcapped range, the Andes, a broad belt of lower ranges, a belt of shingly plain at the foot of these, more or less well watered by streams from the mountains which at last sink into the ground, and then eastward of this the pampas, an enormous area of deep soil like river silt, where, as a saying goes, one can’t be a shepherd because there isn’t a stone to throw at a dog. An idea of the breadth of the country may be gained from Mr Graham’s statement that he accompanied his boss, Mr Gibson on a trip to the Mendoza country, at the foot of the frontal ranges, and it took 28 hours of railing, on the straightest long railroad in the world, to get there. This trip was a revelation to him. Compared with the pampa country, Mendoza is a garden of Eden, all through irrigation. Vines, vines, vines, hundreds of acres of them, the best yielding 100 gallons an acre, and fruit orchards are fast becoming as extensive. Unfortunately there is no water available for the irrigation of the pampas. As a matter of fact, it would only be needed in seasons of drought. At other times the drainage would be of more service. Take it all in all, Mr Graham thinks, there’s no place like New Zealand”. Sometime between 1911 and 1914 the family moved to Mossburn in Southland and it is here we find Lionel in 1914. The Military Services Act came into being in 1916 but prior to this Lionel had his medical examination in Invercargill on 15 December 1915 at the age of 38 years 8 months and enlisted on 10 January 1916 at Trentham. He joined D company, 12th reinforcements, Otago Infantry Battalion with the rank of Private. On the 6th February he was promoted to Lance Corporal and on 1st May 1916 he sailed on the HMNZT51, troopship Ulimaroa from Wellington. The troops arrived at Sling Camp in August and Lionel reverted to the rank of Private. 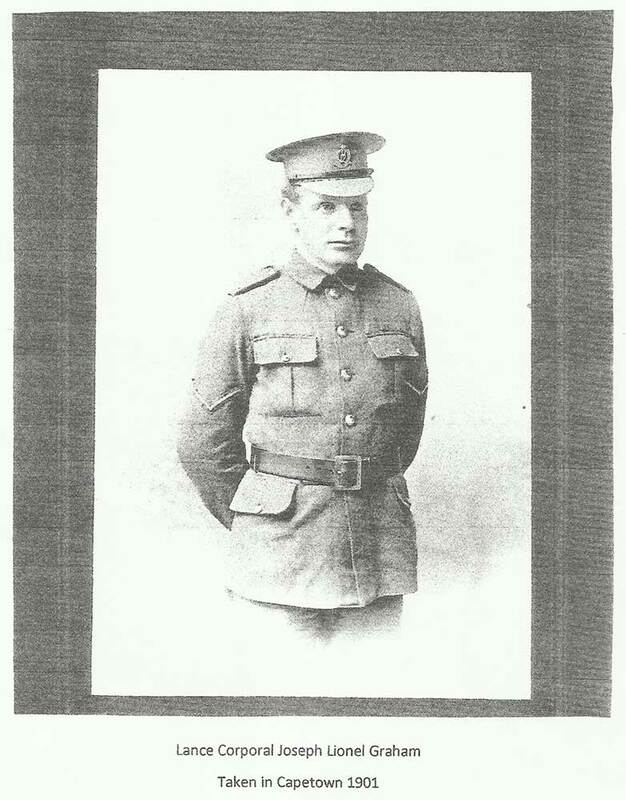 He left for France on the 20th August 1916 and on the 15th September he was wounded in action. He died from his wounds later that day and is buried at Dernancourt Communal Cemetery Extension, Somme, France. He was awarded the British War Medal and the Victory Medal.